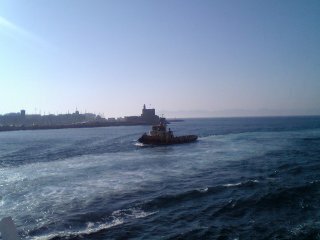 The Greek island of Rhodes is best approached by ferry, past the lighthouse of Rhodes. It is not difficult to imagine the 32 m high bronze statue of Apollo, the Colloulus of Rhodes, standing at the harbour. There is a sense of having arrived and the need to clear customs, as after only a hour long ferry ride from Mamaris, you are now in Greece, not Turkey. There is a small, but good, good duty free store in the port building, just next to the customs hall. 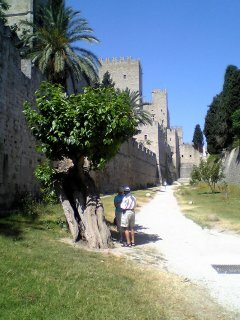 The old town of Rhodes is adjecent to the old port and accessed via the old gates in the city wall. The town has narrow cobbled alleys, with the occasional car, but many motor scooters. 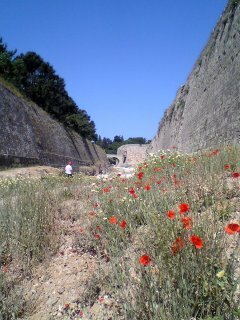 The wall is intact and it is possible to walk in the former moat around much of it. Some of the moat has been tourned into gardens and an outdoor theatre. One of the more comfortable small hotels in old Rhodes town is the Spot Hotel. As well as a brand new cyber cafe, and very comfortable rooms, the hotel has a courtyard for breakfast, with garden. 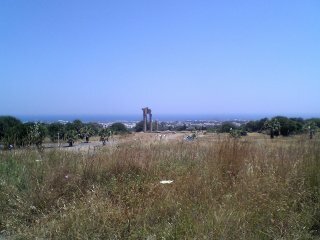 Like much of Greece, the historic sections of Rhodes are being refirbushed, with grants from the EU. 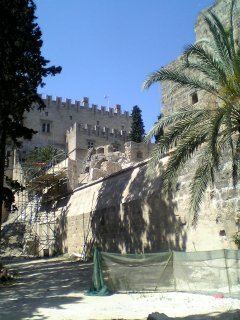 The walls of the city are being repaired. The repairs seem to be done in a medthdocial and sensitive way, to a high standard of work, but taking a very long time to complete. Perhaps it would be quicker to have the wall laser scanned and new blocks cut by a computer controlled robot wheilding an electric saw and chisel, rather than being done by hand on site. Given each restoration project seems to cost the EU at least one million Euros, investment of a few hunderd thousand Euros in the design of a robot stone cutter might save billions. A feature of Turkey and Greece are old, carefully pruned trees. Some of the mulberry and olive trees are so knarled and trimmed that they resembled bonsai. Rhodes has its own tourist train, which winds around the new and old towns and then up to the Acropolis of Rhodes, with veiws of the sea.